There are two types of supervised machine learning algorithms: Regression and classification. The former predicts continuous value outputs while the latter predicts discrete outputs. For instance, predicting the price of a house in dollars is a regression problem whereas predicting whether a tumor is malignant or benign is a classification problem. 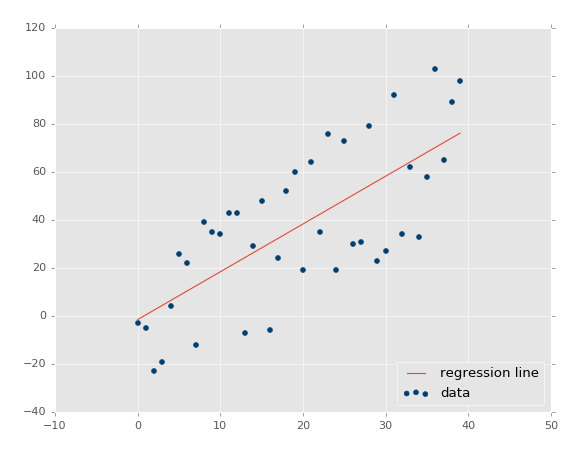 In this article, we will briefly study what linear regression is and how it can be implemented for both two variables and multiple variables using Scikit-Learn, which is one of the most popular machine learning libraries for Python. The term “linearity” in algebra refers to a linear relationship between two or more variables. If we draw this relationship in a two-dimensional space (between two variables), we get a straight line. Linear regression performs the task to predict a dependent variable value (y) based on a given independent variable (x). So, this regression technique finds out a linear relationship between x (input) and y(output). Hence, the name is Linear Regression. If we plot the independent variable (x) on the x-axis and dependent variable (y) on the y-axis, linear regression gives us a straight line that best fits the data points, as shown in the figure below. Where b is the intercept and m is the slope of the line. So basically, the linear regression algorithm gives us the most optimal value for the intercept and the slope (in two dimensions). The y and x variables remain the same, since they are the data features and cannot be changed. The values that we can control are the intercept(b) and slope(m). There can be multiple straight lines depending upon the values of intercept and slope. 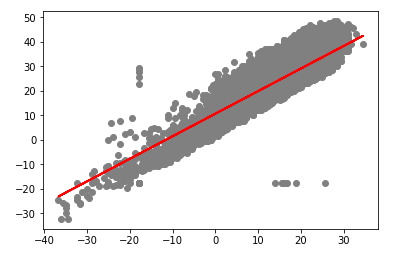 Basically what the linear regression algorithm does is it fits multiple lines on the data points and returns the line that results in the least error. This is the equation of a hyperplane. Remember, a linear regression model in two dimensions is a straight line; in three dimensions it is a plane, and in more than three dimensions, a hyperplane. 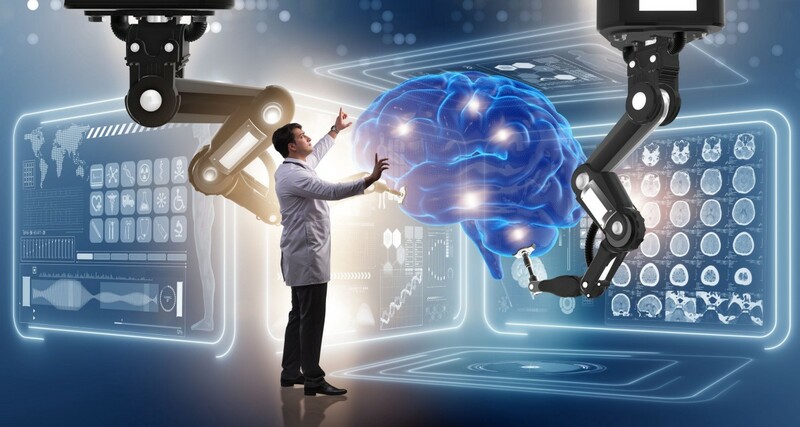 In this section, we will see how Python’s Scikit-Learn library for machine learning can be used to implement regression functions. We will start with simple linear regression involving two variables and then we will move towards linear regression involving multiple variables. While exploring the Aerial Bombing Operations of World War Two dataset and recalling that the D-Day landings were nearly postponed due to poor weather, I downloaded these weather reports from the period to compare with missions in the bombing operations dataset. The dataset contains information on weather conditions recorded on each day at various weather stations around the world. Information includes precipitation, snowfall, temperatures, wind speed and whether the day included thunderstorms or other poor weather conditions. So our task is to predict the maximum temperature taking input feature as minimum temperature. Let’s explore the data a little bit by checking the number of rows and columns in our datasets. You should receive output as (119040, 31), which means the data contains 119040 rows and 31 columns. We have taken MinTemp and MaxTemp for doing our analysis. Below is a 2-D graph between MinTemp and MaxTemp. 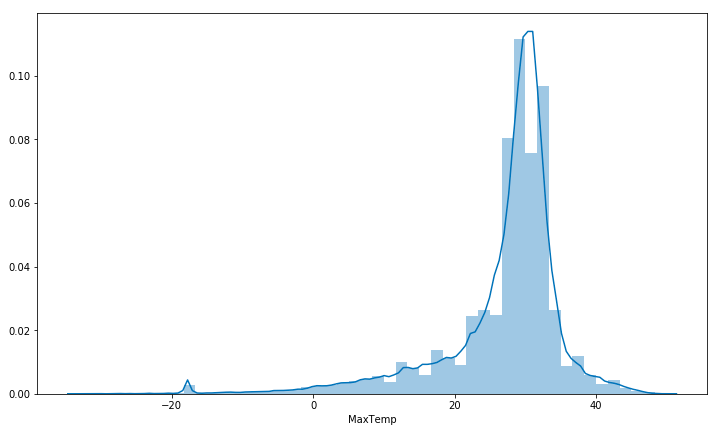 Let’s check the average max temperature and once we plot it we can observe that the Average Maximum Temperature is Between Nearly 25 and 35. Average maximum temperature which is in between 25 and 35. Our next step is to divide the data into “attributes” and “labels”. Attributes are the independent variables while labels are dependent variables whose values are to be predicted. In our dataset, we only have two columns. We want to predict the MaxTemp depending upon the MinTemp recorded. Therefore our attribute set will consist of the “MinTemp” column which is stored in the X variable, and the label will be the “MaxTemp” column which is stored in y variable. Next, we split 80% of the data to the training set while 20% of the data to test set using below code. The test_size variable is where we actually specify the proportion of the test set. After splitting the data into training and testing sets, finally, the time is to train our algorithm. For that, we need to import LinearRegression class, instantiate it, and call the fit() method along with our training data. As we have discussed that the linear regression model basically finds the best value for the intercept and slope, which results in a line that best fits the data. To see the value of the intercept and slop calculated by the linear regression algorithm for our dataset, execute the following code. The result should be approximately 10.66185201 and 0.92033997 respectively. This means that for every one unit of change in Min temperature, the change in the Max temperature is about 0.92%. Note: As the number of records is huge, for representation purpose I’m taking just 25 records. Bar graph showing the comparison of Actual and Predicted values. Though our model is not very precise, the predicted percentages are close to the actual ones. 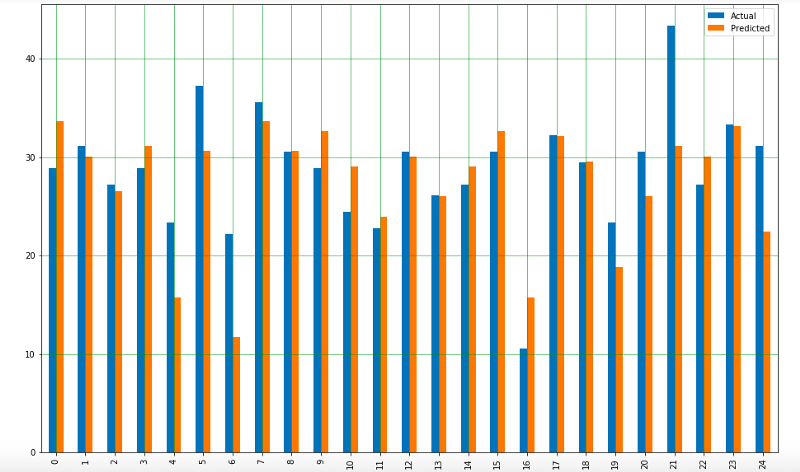 The straight line in the above graph shows our algorithm is correct. Luckily, we don’t have to perform these calculations manually. The Scikit-Learn library comes with pre-built functions that can be used to find out these values for us. Let’s find the values for these metrics using our test data. You can see that the value of root mean squared error is 4.19, which is more than 10% of the mean value of the percentages of all the temperature i.e. 22.41. 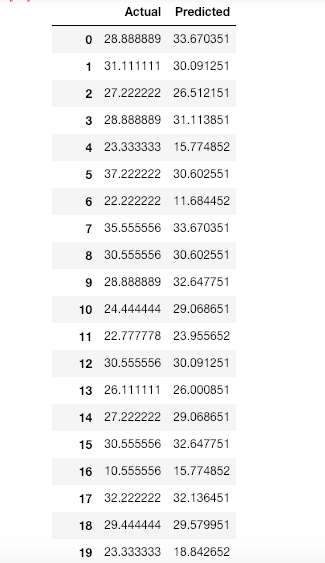 This means that our algorithm was not very accurate but can still make reasonably good predictions.